09: Marionette - When the Fringe Team investigates a case where a victim had his heart extracted, it's just the beginning of a series of mysterious and reanimating events tied together. Meanwhile, Peter comes to terms with the reality of his relationship with Olivia. 10: The Firefly - An Observer makes contact with the Fringe Team to help rectify a mistake. Meanwhile, Walter befriends Roscoe Joyce, keyboardist for Walter's favorite 1970s band, "Violet Sedan Chair." Walter will learn the real reason the band broke up, and realize that the lives of these two men, who have never met before, overlap in strange and unexpected ways. 11: Reciprocity - When the Fringe Team visits Massive Dynamic's assembly of doomsday device, Walter becomes greatly concerned for Peter's well-being, so he turns to Nina for added brain power to understand the relationship between Peter and the super-weapon. Meanwhile, the discovery of a dead body triggers an intense investigation. 12: Concentrate and Ask Again - When a scientist falls dead after ingesting a lethal cloud of blue powder and his bones disintegrate in his body, the CDC suspects a biological attack. 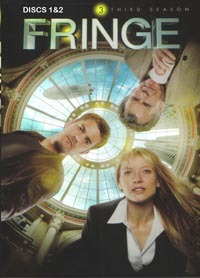 As the Fringe Team investigates further, a subject from Walter's past with ties to Olivia reluctantly agrees to assist with the intense case. 13: Immortality - As the story shifts back to life "over there," the absence of Colonel Broyles shifts the dynamic of the Fringe Team as they investigate a bioterrorist armed with an insect that has a taste for human flesh. Meanwhile, alternate Olivia is reunited with her beau, and Walternate remains determined to save his world but discovers there are certain lines he will not cross. 14: 6B - A series of Fringe events leads the team to the home of a woman grieving over the death of her husband, while Peter and Olivia make an effort to repair the emotional rift between them. 15: Subject 13 - This follow-up to last season's "Peter" flashback episode revisits a poignant period of time for both the Bishops and Olivia.